Note: Originally delivered on March 7, 2007 for the Vespers service at the 40th Annual Los Angeles Religious Education Congress held at the Anaheim Convention Center in Anaheim, California. My brothers, if anyone among you should stray from the truth and someone bring him back, he should know that whoever brings back a sinner from the error of his way will save his soul from death and will cover a multitude of sins. Before I share what is on my heart, I would like to add my own personal welcome to each of you. 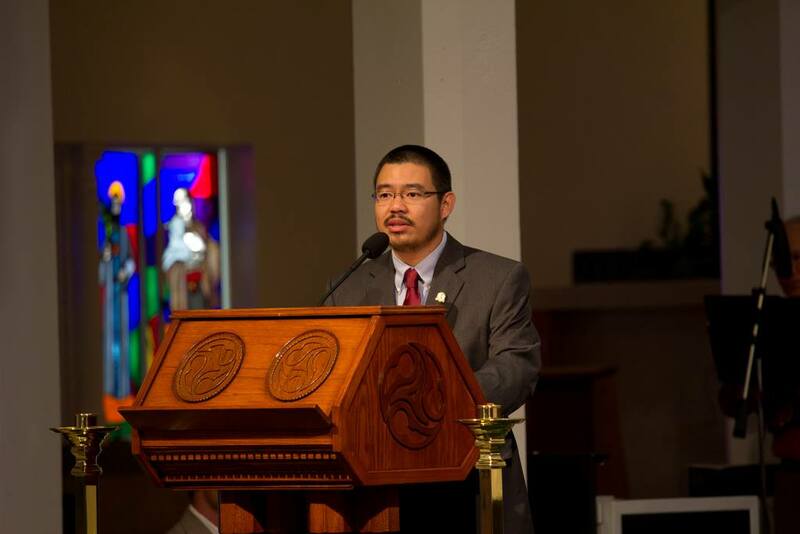 My name is Dung Tran and I serve on the campus ministry team at the Jesuit University of San Francisco. I am delighted to join all of you in prayer this night – to share in one of the most ancient prayer traditions of our Catholic-Christian heritage and faith – a rich spiritual tradition that connects us with Christianity’s Jewish roots. Liturgy of the Hours is a practice intimately attuned to the rhythm of time – the domain of God’s kingdom – as well as the rhythm of our human experience. Liturgy of the Hours helps to give expression to our relationships with self, others, and God. So on this Friday evening of the 1st week of Lent and our first night together at the 40th annual Los Angeles Religious Education Congress, we gather together before God as a pilgrim people offering the richness of our diversity – a diversity of age, ability, culture, gender, language, sexual-orientation, vocation and way of life – to celebrate Vespers. Evening Prayer is an opportunity for each of us to give thanks to God for what has been given to us and to offer prayers of petition that name our struggles, anxieties, and the deepest desires in our hearts. We make these prayers as the sun surrenders to the horizon, and light gives way to darkness. This cyclic movement of day and night, of time and place, is an apt way to describe my life as a lay pastoral minister. When I am not mentoring student leaders in our campus ministry programs, I’m engaged in ministerial formation as a graduate student at the Berkeley campus of the Jesuit School of Theology of Santa Clara University. As part of an ecumenical theological consortium where Catholics, Protestants, and many others engage the God question and dialogically explore the ways our particular faith traditions might respond to God’s word, I have been able to draw upon a wider and deeper well of pastoral wisdom that continues to broaden my theological field of vision and deepen my Catholic faith. For me, this has been a rich and horizon expanding experience. At the same time, theological exploration can be really challenging since our respective faith traditions do not agree on everything. Dissent and disagreement in a community context is where the wisdom from James is critical. This passage is a rich source of reflection for any community that claims to concretize the faith of Christ in our contemporary context. Earlier in the fifth chapter of James, the author describes the dynamics of community conflict that all of us are intimately familiar with on some level. As we all know, conflict can breed stress which can lead to grumbling, slander and condemnation. Conflict can threaten the identity and stability of any community. Conflict in the context of community is an invitation to discern. How will we choose? Will we act in self-interest and greed? Or will we choose to work for healing and reconciliation as people of integrity and love? A life-affirming response to these and many other questions is what it means to be a Christian disciple. To help us better understand the choice of Christian discipleship, I would like to draw upon the wisdom of an anonymous English monk who during the late 14th century authored, The Cloud of Unknowing. This treatise on contemplation counsels a young student to seek God through love instead of relying on knowledge alone. This practical spiritual guidebook has informed and inspired generations of mystics from John of the Cross to Teilhard de Chardin, S.J. It has also formed the basis for centering prayer, made famous by Trappists such as William Meninger, O.C.S.O. and Thomas Keating, O.C.S.O. – a practice which our dancers beautifully embodied prior to our gathering song. Love Jesus and everything that he has will be ours, we are told. We ought to knit ourselves to God through love and faith. Above there is the “cloud of unknowing” or darkness between the human person and God. Beneath us we must put a “cloud of forgetting” whereby we destroy all understanding and awareness with sharp darts of longing love. We must penetrate the darkness above, this cloud of unknowing, so that we can lovingly gaze into the being of God. All the time, we must wait patiently for the Lord, the author tells us, with courtesy and humility, laboring and persevering in prayer. This next line is particularly memorable: “It is not what you are nor what you have been that God looks at with his merciful eyes, but what you desire to be” (pp. 133-134). I think prayer is often like that. It is the love, zeal, and enthusiasm we would like to bring to God but cannot – either in words or in feelings. But at least we can bring our desire for such, or at least our desire for the desire. Pray fervently and for healing our Scripture tells us tonight. We too are called to cry out to the Lord, day and night, and to listen to what God might be saying to us. Prayer is faith in action. Prayer is not an optional exercise in piety carried out to demonstrate our relationship with God. Rather, it is that relationship with God. The way we pray reveals that relationship. Amy and Isabel’s testimony reminds us that Christian discipleship is not easy. It demands difficult inner work and can be devastatingly painful. At the same time, Amy and Isabel’s tearful exchange reveal to us an edifying consolation – a quiet confidence and trust in a God who is actively laboring on our behalf – themes that we heard in the proclamation of psalm 46. So as we continue on our Lenten journey toward renewal, let us ask for the grace to be generous in our prayers for one another. May we seek healing in the areas that prevent us from growing into God’s dreams for us. May our prayers help us to trust in ourselves, our experiences, and in God – The God who loves us beyond our understanding, the God who is companion, often at our side, but occasionally out in front, leading us into unknown and uncharted interior places that frees us to become more fully ourselves and in turn love others in life-giving ways. And when that happens, and as that happens, my guess is that we will discover – much to our own surprise – that we not only stand in the light, but we reflect light onto a difficult and dark reality that desperately needs our spiritual generosity. The cloud of unknowing and the book of privy counseling. (2005). W. Johnston (Ed.). New York, NY: An Image Book.